A social intranet encourages a tremendous volume of knowledge sharing. As collaboration via the intranet increases, how can you keep all that content relevant and findable? ThoughtFarmer 3.6 introduces three important new features to deal with the challenge of a high volume of shared knowledge: Personal Home Pages, Search Filters and Customizable Groups. An accountant uses the intranet differently than an engineer. An HR manager uses the intranet differently than a graphic designer. 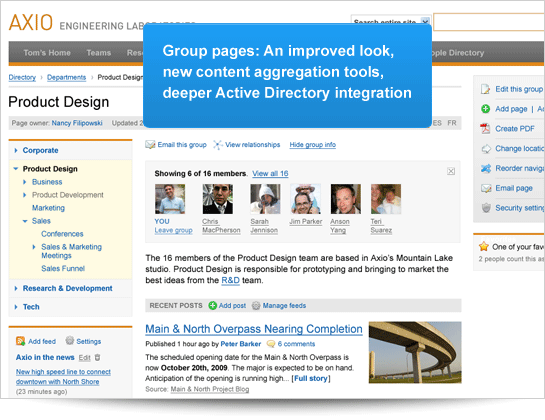 How can the intranet home page be made relevant for each discreet group? Enter the new ThoughtFarmer Personal Home Page. This new feature automatically personalizes certain areas of the home page and allows other areas to be intelligently personalized, on a group-by-group basis, by the intranet manager. Group membership can be managed by Active Directory so employees see a personalized home page the first time they visit the intranet, without having to customize settings themselves. 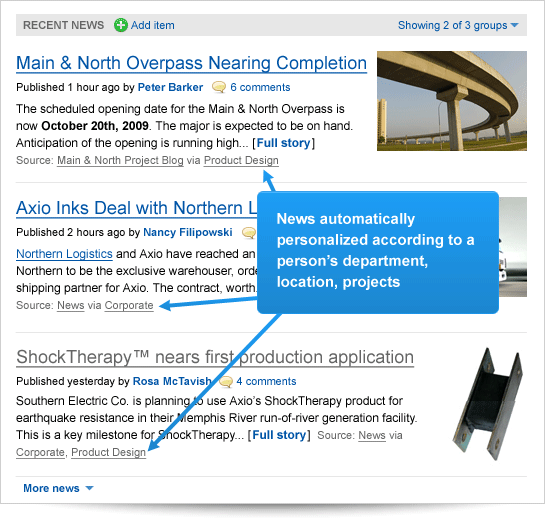 The Recent News area is one example of personalization. You can ensure that engineers see the latest from the engineering blog, support staff see new bulletins on changes to back-office procedures, and everyone sees the latest from the CEO’s blog. With Personal Home Pages, you can deliver relevant content to each audience. News on Personal Home Pages. Learn more about News in ThoughtFarmer. Recent Activity on Personal Home Pages. Learn more about Recent Activity in ThoughtFarmer. “It’s not information overload. It’s filter failure.” So says Clay Shirky, New York University New Media Professor, on the problem of dealing with an ever-increasing volume of information. General keyword search is not sufficient, especially when you’re performing a known-item search — a search, for example, for a specific document that you know your colleague posted to the intranet last week. Enter ThoughtFarmer Search Filters. Using the intuitive Filter panel, you can quickly narrow down a search to a specific type of document, edited by a specific person, in a specific time frame. It’s simple and extremely effective. 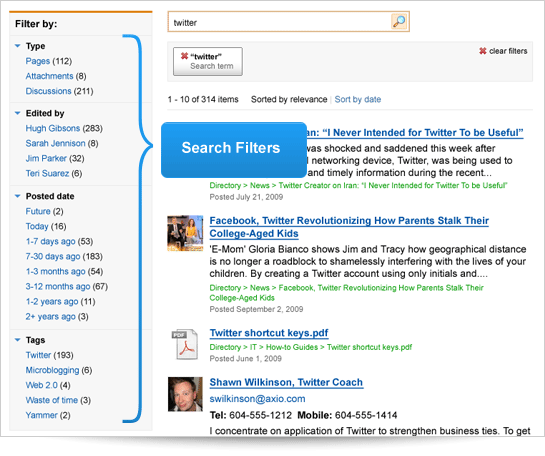 Search Results Screen. Learn more about Search in ThoughtFarmer. Collaboration within groups is the backbone of a ThoughtFarmer-powered intranet. In ThoughtFarmer 3.6, Groups are more flexible and robust than ever. An improved interface lets you see at a glance the members of each group. New content aggregation tools let you syndicate content from across ThoughtFarmer and across the internet. 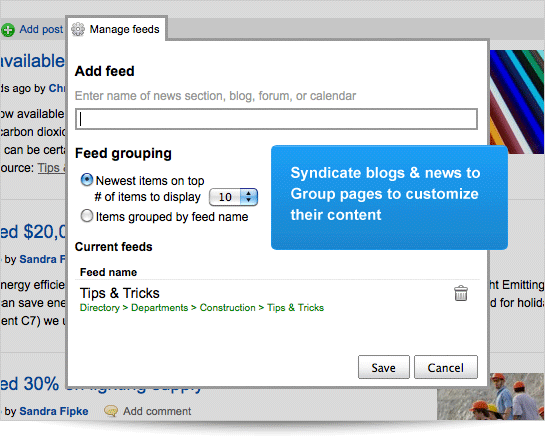 Gather all the relevant news, blogs, and discussions into a single place for your group members. 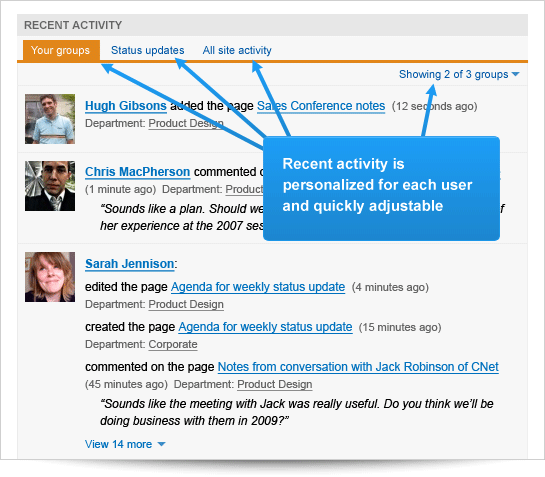 Through Personal Home Pages, joining a Group delivers Group News and Group Activity to your home page. Active Directory synchronization is more flexible than ever, so you can securely and automatically manage group membership (read more about Active Directory sync). Scoped Search. 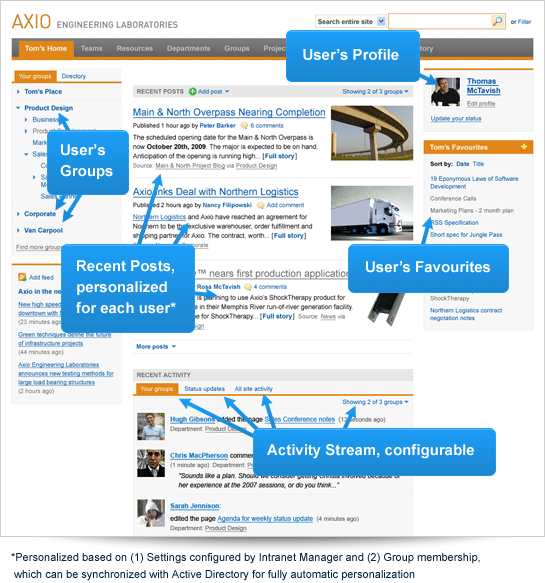 Restrict your search to just a specific section of your intranet. More about Search. Faster installation and upgrades. Sometimes in less than a minute! Faster home page load. Intelligent caching reduces home page size to an average of just 45 kilobytes. Auto-linking of web addresses. Both in page content and comments. Predictive preloading of news items. When you click “View more”, you see more news items instantly, because they’re preloaded. More about News. Why not try ThoughtFarmer 3.6 right now? Get instant demo access or request a guided tour.